I am beset with them. They half stuffed my overseas trip...now they are threatening my exercise program! I mean,. I am not really a wuss...I have walked on them until they are numb, and my shoes were wet with blood and blister fluid. All that seems to happen is that I get different layers of blister...until I am expecting bone to pop out of the affected toes cos I don't believe there are any more layers of skin. I have two different pairs of walking shoes which seem extremely comfortable for the first few hours. I am swapping them around now...but because the blisters sort of stick out, ANY shoe seems to exacerbate them. Any clever ideas or fixes? Got to go bandage a damn blister. I can't recommend anything for the blisters while you are walking around, but in the evenings, it would help if you could soak your feet in a tub of water, as hot as you can stand it, with Epsom salts in it. Epsom salt is magnesium sulfate (hadda go look it up). You should be able to get that at any chemists, or in the medical section of any variety store or supermarket. Really. Interesting....what does that do for the blisters? I think I HAVE some here. It acts as an astrigent and a mild antibiotic. It will dry out the tissue, and help to prevent infection. About a half cup in a basin large enough to get your feet in should do the trick. Oh and I'd go to a sportings goods store and have them fit you for walking sneakers. Not cross-training, not running, but walking. And make certain that they measure you (and go after you've walked a bit, so that your feet are a lil swollen). Also ask them for sock recommendations to wear with said proper walking sneakers. You probably can't wear them everywhere (they're not exactly formal), but you can at least make it so that you're comfy much of the time. Take great care to always wear clean socks. Infection is a day away if you dont. Setanta gave good advice. They need to be dried. The soaking is to remove any germs and dirt. In the army they put formaldihide on ours (yes I know what that is). Air is great for them if you can put your feet up. Do not walk around bare foot. Forget bandaids. You need some little dressings of dry gauze. Soak them off if they stick. It hurts but you can also sprinkle table salt on them. I once had to rub salt into a fissure in my groin from marching in the wet tropics. It was the only way to clean and dry given the environment. Two things : clean and dry. Hope you get better soon. That's a good idea, Jes . . . and she could wear them to work, while carrying her "work" shoes in a bag. I wish I had a few. These are blisters you developed on your 0/s trip which have lingered? The first thing I thought of: different, more suitable shoes, perhaps? What sort of walking shoes are you wearing? I would suggest two pair of socks. I wear a minimum of three pair when I play soccer, and haven't had a blister since high school. For blisters, the trainers at my college would fashion a piece of moleskin (or two pieces, depending on the size of the blister) with a hole cut out in the center for the blister to go. Seemed to help those dealing with blisters. As far as the advice about not going barefoot, I'm not sure I agree. It may not help your current blister situation, but I would think it would toughen up your feet to help prevent blisters in the future. I could be completely wrong, of course. Pilots in Vietnam would run barefoot in case they got captured. The first thing they would lose if captured would be their boots, so they had to prepare for the worst scenario. You are right, bare foot walking toughens the skin, but this can also make it difficult to wear shoes. Tough feet for bare foot, soft feet for shoes. The bare foot comment I made was only to avoid infection whilst the blisters were still there. I know one soldier who got an infection from the shower and lost pieces of his feet. If he had of been older, he could have done far worse. The bare foot comment I made was only to avoid infection whilst the blisters were still there. Lots of good ideas so far. The moleskin with a hole is interesting.. certainly the epsom salts. 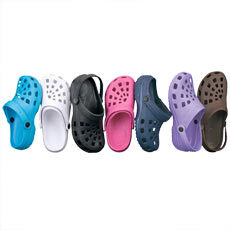 My two cents - I wear faux crocs around the house to keep my feet nice and aired out, and recommend those, however malevolently ugly they are. My toes don't touch the sides of the shoes, by a long shot. The bottom of the shoes they do, so it would depend on where the blisters are exactly. That's what I have...though thanks anyway. I really am walking9 in damn good shoes. I don't walk far in dress shoes. Oh I nearly forgot...put betadine on or something similar after showering...a lot of germs breed on shower floors and the germs from all over your body wash down over your feet. Where do you get moleskin? It's interesting all this drying out talk...the special blister bandages keep 'em quite wet... while I find letting them dry out naturally (with the skin still on...which my really deep ones all have, because they're on really tough areas of my feet)....is great and the best thing (this means the growing skin is kept moist) except I have to stop walking to do that!!! Grrrr. Mine don't get infected for some reason. I go barefoot a lot inside...and it doesn't affect the beasts. Unless I have a raw bleeding one like I have on my middle toes right now...because the skin came off. I am getting them from long walking...so the crocs are good for slopping around the house, but not a solution for the problem. It's bloody weird that's what it is!!! I have ASICS which were fitted and have hitherto been FINE! I bought another pair of a good different brand, and they were fine for a couple of weeks...now they are savaging my two middle toes...seems to be because these are the toes which sort of grip inside the shoe as I walk. The trip blister (there was only one really bad one..on my little toe...it was agonising!) has almost healed, but that toe is still vulnerable because the problem went through so many layers of skin (blister under blister under blister etc...turtles and pain all the way down!) that the skin there is still kind of tender and weak. I had some other very deep ones on the heel and the outer side of my feet...blood blisters...but the skin never broke, so they have been happily healing and the pain never got to a worrying level. But what about refraining from too much walking till all the blisters have had a chance to properly heal?